If you need a place to store your necklaces, earrings, and bracelets, make jewelry boxes that are as unique as you. Large craft stores such as Hobby Lobby and Michaels Crafts often have plain wooden jewelry boxes in various sizes that you can decorate. Check your local newspaper or the company Web site for coupons to use on your purchase. Paint your wooden jewelry box the base color of your choice. Let dry thoroughly. Cut your collage items to fit your jewelry box, using the craft knife to get into the small corners. Use the foam paintbrush and Mod Podge to adhere your collage pieces to your jewelry box. Smooth out any air bubbles with the popsicle stick and let dry thoroughly. Sand off any rough edges or use the emery board to give your collage a distressed look. Coat with two or three layers of Mod Podge to seal the box, allowing the box to dry for several hours between coats. Add ribbon, rhinestones, or other embellishments if desired. DIY Organization on Youtube: Use acrylic paints and a stencil you make yourself to create a custom box. Artists Helping Children: These simple projects are great crafts to enjoy with your children. Ana White: If you have carpentry skills, you can try this major project and construct your own fancy jewelry box/armoire. If you've found a secondhand jewelry box that simply has a few minor cosmetic flaws, check out the Mod Podge Rocks! article on Jewelry Box Makeovers for repair suggestions. 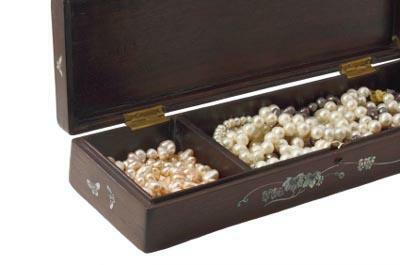 Because a handmade jewelry box makes a lovely gift for any woman, jewelry boxes are great craft ideas to sell. If you can come up with a design that is easily reproduced, you can sell your product at local craft shows or online through a site such as Etsy. In addition, jewelry boxes are a wonderful complimentary craft for someone who has a home-based business selling handmade jewelry. It's only natural that a customer who loves unique accessories would be searching for a special way to store her jewelry collection.